I’ve been very excited about this review for a while. I moved to Edinburgh four months ago now, and I was eager to find my essential foodie spots: the farmers’ markets, my preferred supermarket, my local pub and café, and the like. It was at the Edinburgh farmers’ market, on a cold Saturday in January, that I stumbled upon a stall of chocolate bars. The stall holder handed me a free – FREE – cup of hot melted chocolate. Just water and chocolate, melted together. It coursed through me like a magic potion, thawing my chilled body. And man, it tasted good. That stall belonged to The Chocolate Tree. Most weeks I visit the farmers’ market. I make sure to buy my fruit and veg first, and what money I have left goes on chocolate. I knew the company owned a shop in Edinburgh as well – not far from where I live in the West End, actually – but I knew the temptation would no doubt bankrupt me and expand my waist size exponentially. And yet, I had to know… so I finally went! 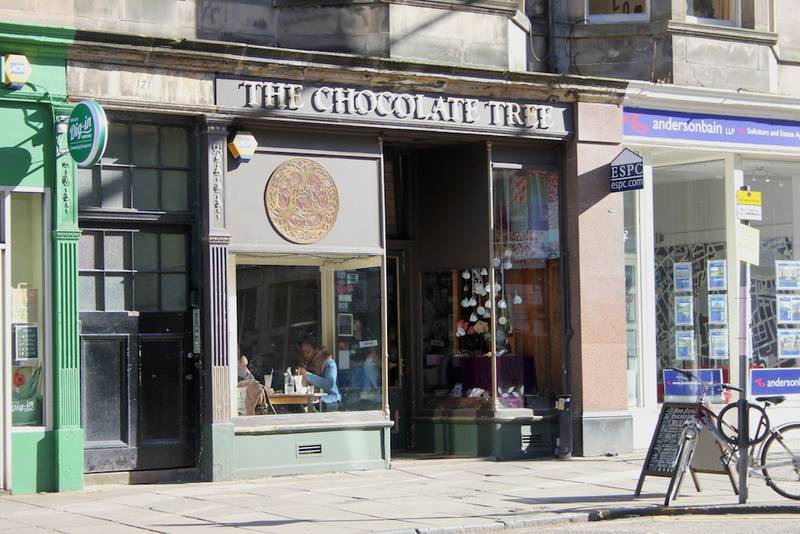 Let me walk you through the wonderful shop that is The Chocolate Tree, in Bruntsfield, Edinburgh. It’s a little like Willy Wonka’s chocolate factory meets the witch’s wood carving shop in Brave: all dark and moody wood furniture, electric wallpaper and classic mural paintings. The business started as a solar-powered chocolaterie touring festivals across the UK, and TCT is still committed to recycling and being kind to the environment: they use biodegradable cellophane for their packaging and reusable FSC certified paper to print their labels on. I’ve quickly fallen in love with this brand and this company because a) their chocolate is orgasmic, and they’re not afraid to play with flavours (but more on that later) and b) their staff are so dedicated to giving you the best experience enjoying their chocolate. They are always chatty at the market stall, telling me all about their chocolate-making process and telling me about their vegan options, and giving me free hot chocolate to taste. My favourite flavours so far are peppermint, cardamom, salted caramel and haggis (!!). I was really into winter spice over the cold months, and probably would still enjoy it now if I wasn’t so enamoured with cardamom. It’s important to mention that their chocolate is made bean-to-bar, which means it’s all made right here in Edinburgh from raw cacao beans to achieve the best result possible. I had the most delicious vegan chocolate Easter egg, made with creamy coconut milk, and I wish I had bought more (but my bank account thanks me for exercising some restraint) because IT WAS THAT GOOD, but they also had plenty of dark chocolate bunnies (and they might still have some if you hurry and snap ’em up!). You can’t visit the shop and not try the Giandutto truffles. You know how much I love that hazelnut-chocolate combination – just see my Gianduja Chocolate Mousse Cake recipe for proof – and these truffles did not disappoint. All their truffles are labelled with vegan and dairy-free when they are so. They also sell sorbets (all vegan) and ice creams (not vegan) in their shop, plus a vegan chocolate spread that I have yet to try but have my eye on. And if you need an impressive cake for a party, you’re in luck: The Chocolate Tree also makes whole cakes! In short, The Chocolate Tree is the perfect place to spend a lazy Sunday afternoon sipping on hot chocolate at one of their tables by the window. 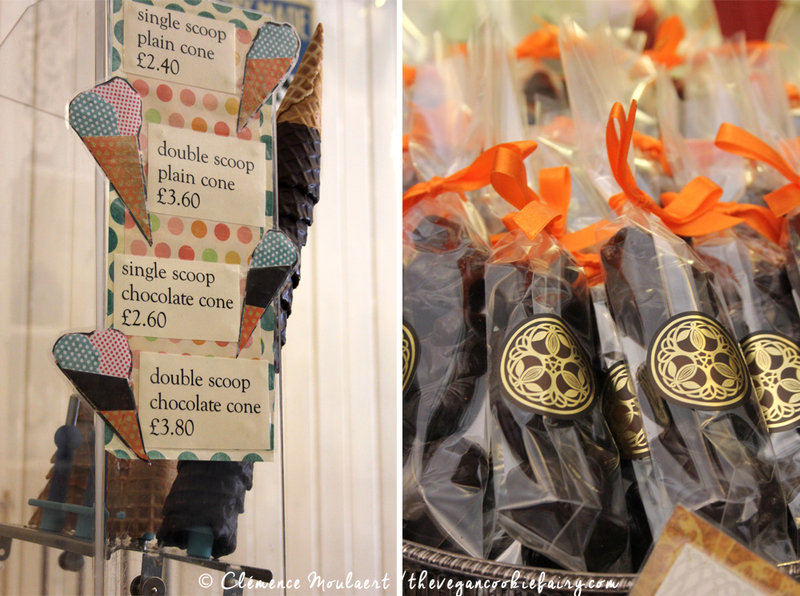 And don’t forget to take a few of their chocolate bars home with you – one isn’t enough! + they’ve got a shop in Haddington, too! Did you like this post + recipe? Then sign up for email updates and receive my free ebook, 5 Recipes For A Fabulous Weekend! Mm mm yummy, can we go when I come end may please ??? Hello! Welcome to my blog, little cookie monsters.